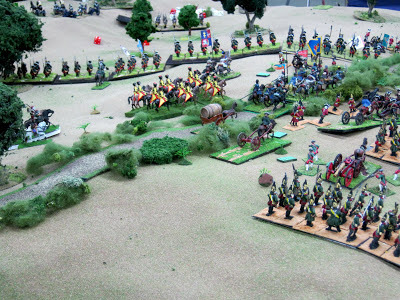 After we complete 4-5 tabletop games in as many regions, Cycle #1 of the Seven Years' War will end for us. Last July the first game was in East Prussia. See the link above. The second encounter was yesterday in Silesia. In the coming months we will repair to somewhere near Bohemia, followed by western Germany and then perhaps to Canada. Afterwards Cycle #2 will restart our version of the SYW. 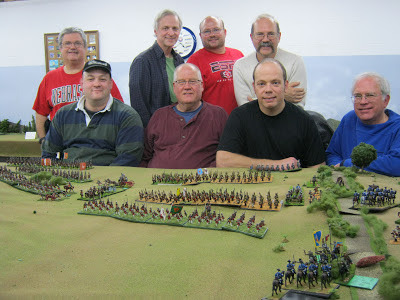 I write this report mostly from the perspective of my personal command miniature posted in the rear in central reserve. More happened than the title of this post implies. Somehow folks hereabouts think my favorite things to command in tabletop games are highly mobile combatants; horsemen and armored fighting vehicles. True! 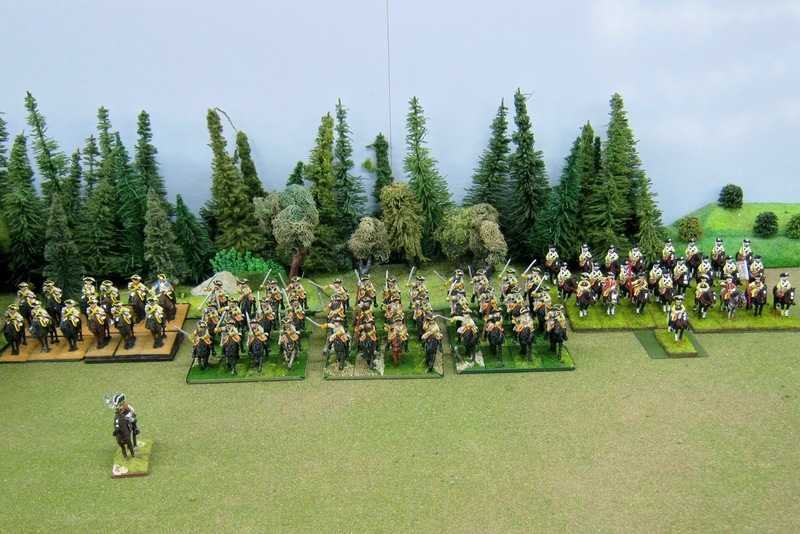 You will command all the other cuirassier squadrons too. Well WELL! That's the ticket! Naturally I agreed. Seven squadrons are shown above with three more off image to the left. My Leibkürassiers are on the right side of the photo. We are on the Back Table in central reserve awaiting orders. 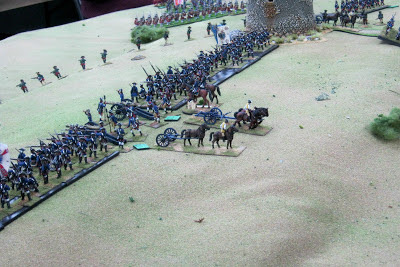 Opposing me on the Main Table was a Prussian Brigade with a battery of 12 Pdr. 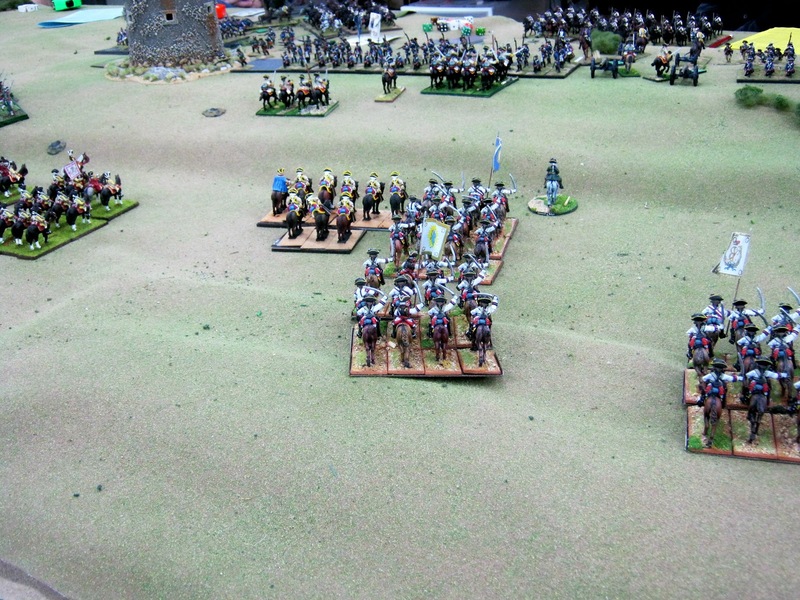 Brummers commanded by Keith L.
To their left the Prussians extended their line on top of a gently sloping ridge. (Think Cemetery Ridge at Gettysburg.) 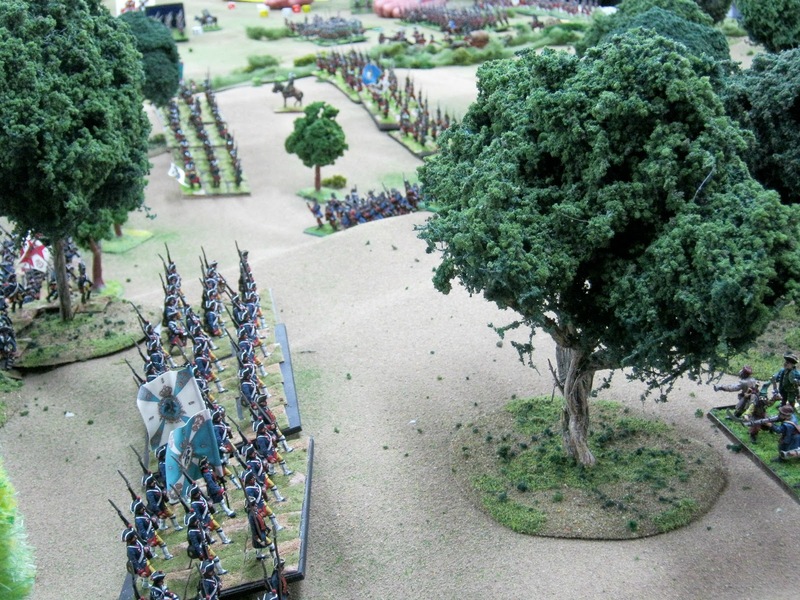 Todd B. was posted here to the end of the Prussian line. To my right Russian heavy forces commanded by Michael M. advanced onto the Main Table at mid-afternoon. Previously horsemen had been battling in the open wooded area in the top center and right of the image. When units march from the Back Table onto the Main Table it is sometimes difficult to ascertain just where something is. 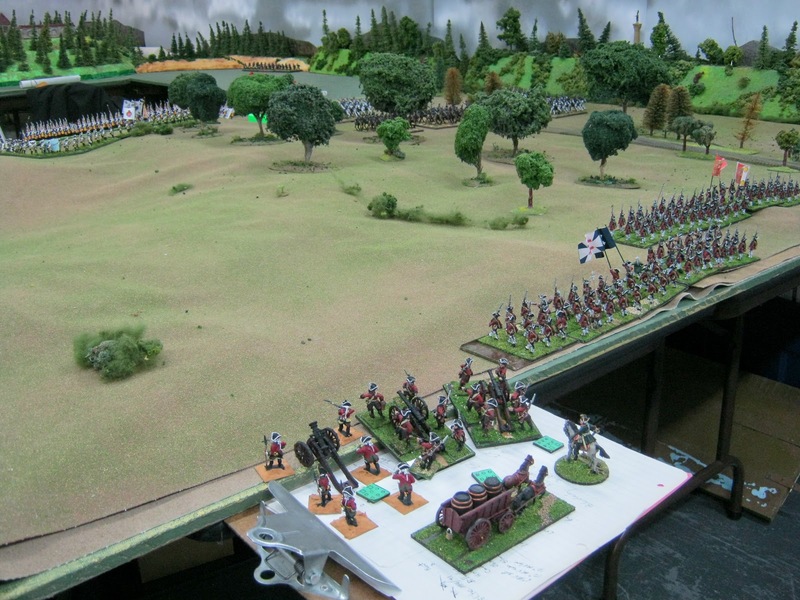 In the above image a clipboard was inserted under terrain boards to place an artillery battery that had not quite gotten onto the Main Table yet. Helpful. What about my cavalry? Orders arrived to advance near 3:00 pm. Thoughts of the French cavalry at Minden danced in my head. Okay. I would try something different. With a little luck! I sounded the charge. Four squadrons led at the gallop. The others hung back in the intervals at the canter. 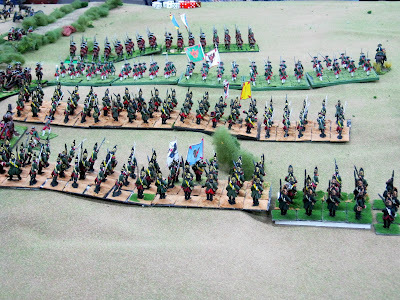 The Prussians fired everything they had! The battalion fired poorly. The luck I needed happened. This image shows the moments after the first melee round.The squadron with the bright blue coat failed to charge due to losses. The other three went in. In the upper left one squadron fell back to rally. The central squadron did better electing to remain in contact. The right hand squadron lost ten of twelve riders to Brummer canister fire, amazingly held morale and cut down the crews. If you look closely you will see two cuirassiers amidst the guns a la Balaclava. 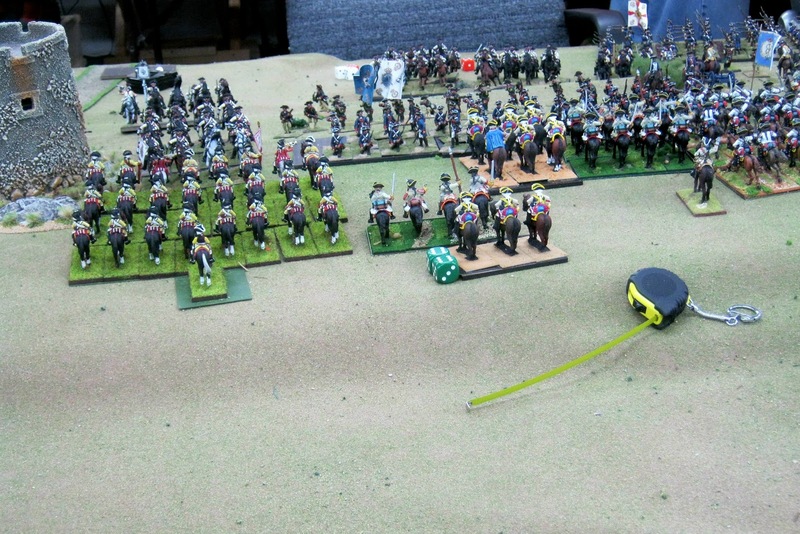 If you look deeper at the top of the image, Prussian cuirassiers are riding to the rescue. Lots of 'em. Never mind. I knew they were coming. However my personal miniature could not see them. 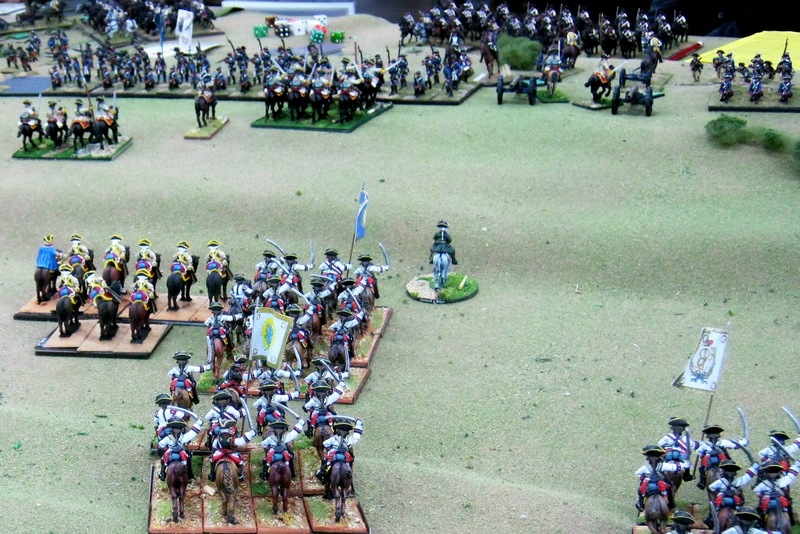 He ordered last reserves to sweep the Prussian musketeers off the ridge. When my Leibkürassiers topped the ridge they immediately saw the Prussian Garde du Korps and switched to attack them per the rules. We won the first round. To their right my remaining heavies crossed sabers and bayonets with the infantry. The blue coats would lose with survivors routing away. Fortunately two things happened next. 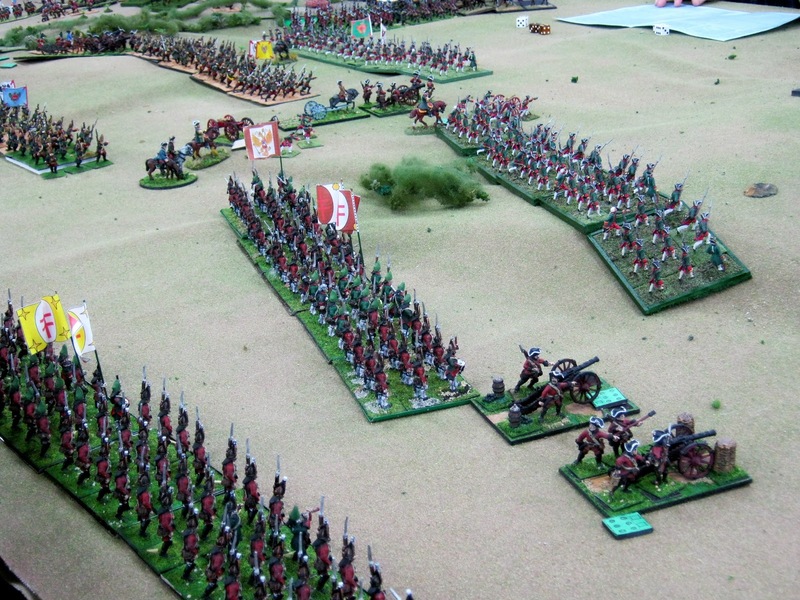 #1 A die throw prevented the Russian cuirassiers from pursuing the routing infantry. 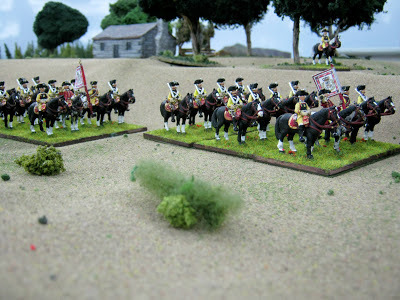 Had they done so, the rules would have required a cavalry engagement with the Prussian horsemen coming on strong that turn. #2 It was 4:30 pm real time. Quitting time for the turn in progress. Game over. From left to right Michael M., John B. (seated) , Jim P. (Der Alte Fritz), Brent O. 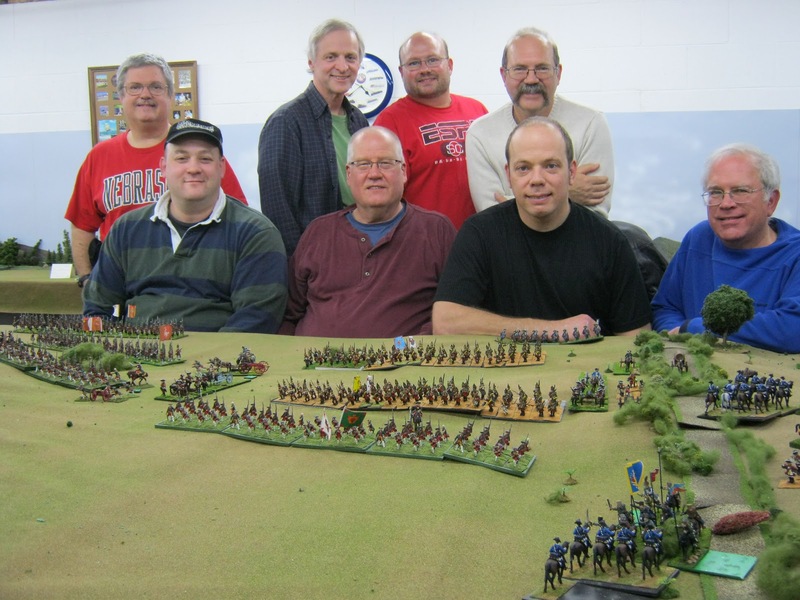 (seated), Todd B., John M., Chris K. (seated) and last Bill P. Not pictured: Earl K. and Keith L. Participants came from Illinois, Minnesota and Wisconsin. 1. 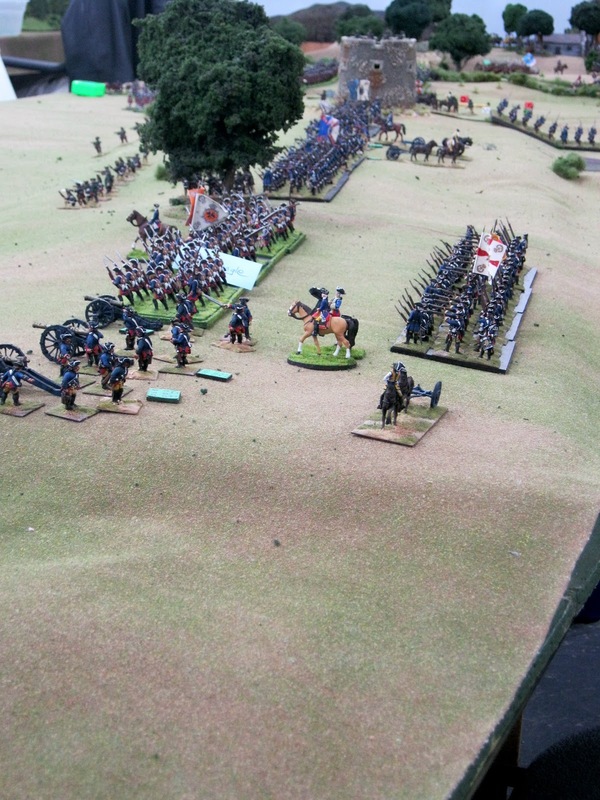 At 4:30 the Russian extreme left held on with trouble, our powerful near left was unstoppable and would break through to the Prussian Back Table and my cavalry was temporarily victorious on the ridge. The Russian right was sweeping forward. 3. The others thought the Russians won the day. No one disagreed. 4. Reader remarks are welcome below.